Earth's newest crust is created at sites of seafloor spreading—red sites on this map. Seafloor spreading is a geologic process in which tectonic plates—large slabs of Earth's lithosphere—split apart from each other. Seafloor spreading and other tectonic activity processes are the result of mantle convection. Mantle convection is the slow, churning motion of Earth’s mantle. Convection currents carry heat from the lower mantle and core to the lithosphere. Convection currents also “recycle” lithospheric materials back to the mantle. with the flight going from east to west and diving down the Southwest indian Ridge (SWIR). Triple junctions are the intersection of three divergent plate boundaries. The triple junction is the central point where three cracks (boundaries) split off at about 120° angles from each other. Seafloor spreading occurs at divergent plate boundaries. As tectonic plates slowly move away from each other, heat from the mantle’s convection currents makes the crust more plastic and less dense. The less-dense material rises, often forming a mountain or elevated area of the seafloor. Hot magma fueled by mantle convection bubbles up to fill these fractures and spills onto the crust. This bubbled-up magma is cooled by frigid seawater to form igneous rock. This rock (basalt) becomes a new part of Earth’s crust. Seafloor spreading occurs along mid-ocean ridges—large mountain ranges rising from the ocean floor. The Mid-Atlantic Ridge, for instance, separates the North American plate from the Eurasian plate, and the South American plate from the African plate. The East Pacific Rise is a mid-ocean ridge that runs through the eastern Pacific Ocean and separates the Pacific plate from the North American plate, the Cocos plate, the Nazca plate, and the Antarctic plate. The Southeast Indian Ridge marks where the southern Indo-Australian plate forms a divergent boundary with the Antarctic plate. Seafloor spreading is not consistent at all mid-ocean ridges. Slowly spreading ridges are the sites of tall, narrow underwater cliffs and mountains. Rapidly spreading ridges have a much more gentle slopes. The Mid-Atlantic Ridge, for instance, is a slow spreading center. It spreads 2-5 centimeters (.8-2 inches) every year and forms an ocean trench about the size of the Grand Canyon. The East Pacific Rise, on the other hand, is a fast spreading center. It spreads about 6-16 centimeters (3-6 inches) every year. There is not an ocean trench at the East Pacific Rise, because the seafloor spreading is too rapid for one to develop! The newest, thinnest crust on Earth is located near the center of mid-ocean ridge—the actual site of seafloor spreading. 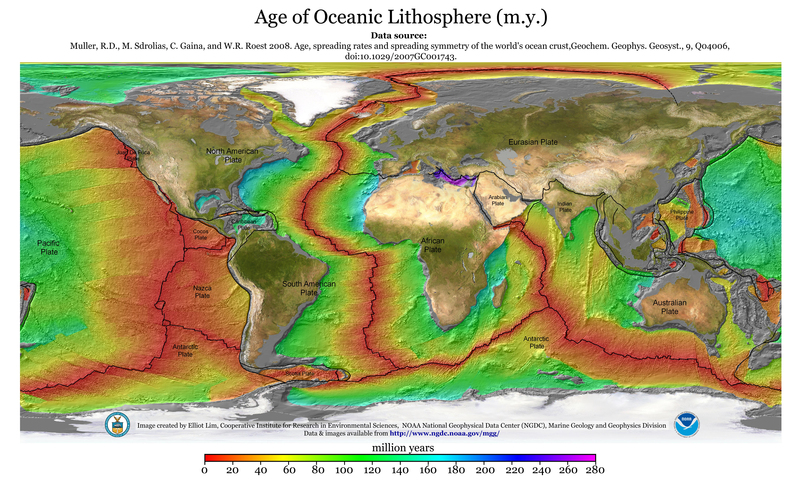 The age, density, and thickness of oceanic crust increases with distance from the mid-ocean ridge. The magnetism of mid-ocean ridges helped scientists first identify the process of seafloor spreading in the early 20th century. Basalt, the once-molten rock that makes up most new oceanic crust, is a fairly magnetic substance, and scientists began using magnetometers to measure the magnetism of the ocean floor in the 1950s. What they discovered was that the magnetism of the ocean floor around mid-ocean ridges was divided into matching “stripes” on either side of the ridge. The specific magnetism of basalt rock is determined by the Earth’s magnetic field when the magma is cooling. Scientists determined that the same process formed the perfectly symmetrical stripes on both side of a mid-ocean ridge. The continual process of seafloor spreading separated the stripes in an orderly pattern. Oceanic crust slowly moves away from mid-ocean ridges and sites of seafloor spreading. As it moves, it becomes cooler, more dense, and more thick. Eventually, older oceanic crust encounters a tectonic boundary with continental crust. In some cases, oceanic crust encounters an active plate margin. An active plate margin is an actual plate boundary, where oceanic crust and continental crust crash into each other. Active plate margins are often the site of earthquakes and volcanoes. Oceanic crust created by seafloor spreading in the East Pacific Rise, for instance, may become part of the Ring of Fire, the horseshoe-shaped pattern of volcanoes and earthquake zones around the Pacific ocean basin. In other cases, oceanic crust encounters a passive plate margin. Passive margins are not plate boundaries, but areas where a single tectonic plate transitions from oceanic lithosphere to continental lithosphere. Passive margins are not sites of faults or subduction zones. Thick layers of sediment overlay the transitional crust of a passive margin. The oceanic crust of the Mid-Atlantic Ridge, for instance, will either become part of the passive margin on the North American plate (on the east coast of North America) or the Eurasian plate (on the west coast of Europe). New geographic features can be created through seafloor spreading. The Red Sea, for example, was created as the African plate and the Arabian plate tore away from each other. Today, only the Sinai Peninsula connects the Middle East (Asia) with North Africa. Eventually, geologists predict, seafloor spreading will completely separate the two continents—and join the Red and Mediterranean Seas. Mid-ocean ridges and seafloor spreading can also influence sea levels. As oceanic crust moves away from the shallow mid-ocean ridges, it cools and sinks as it becomes more dense. This increases the volume of the ocean basin and decreases the sea level. For instance, a mid-ocean ridge system in Panthalassa—an ancient ocean that surrounded the supercontinent Pangaea—contributed to shallower oceans and higher sea levels in the Paleozoic era. Panthalassa was an early form of the Pacific Ocean, which today experiences less seafloor spreading and has a much less extensive mid-ocean ridge system. This helps explain why sea levels have fallen dramatically over the past 80 million years. Seafloor spreading disproves an early part of the theory of continental drift. Supporters of continental drift originally theorized that the continents moved (drifted) through unmoving oceans. Seafloor spreading proves that the ocean itself is a site of tectonic activity. Mid-ocean ridges extend for 70,000km around the globe. They are the Earth's tectonic plate boundaries and creators of its crust. Yet theyremain almost completely unexplored. glimpse of what we do know about these fiery sea monsters. Seafloor spreading is just one part of plate tectonics. Subduction happens where tectonic plates crash into each other instead of spreading apart. At subduction zones, the edge of the denser plate subducts, or slides, beneath the less-dense one. The denser lithospheric material then melts back into the Earth's mantle. Seafloor spreading creates new crust. The two forces roughly balance each other, so the shape and diameter of the Earth remain constant.